Manufacturers: We cut to your specs and can make all shapes of poly parts! Belt trailer replacement poly: Any size for under the chain or for the side wall. Why Do You Need Plastic? A liner will help eliminate sticking problems, which will allow you to haul more loads with less carry back. Hoist and drive train failures are reduced. Lowers the freezing temperature of the material being hauled so winter hauling is possible. Trailer tip overs are reduced. Belt trailers require up to 40% less hydraulic power to move the chain. 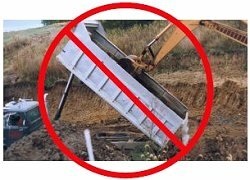 Reduces bridging in bins and trailers.